Welcome to the Max building - Stunning 15th floor 2 BEDROOM + den boasts immaculate southwest water views of False Creek and Marinaside. 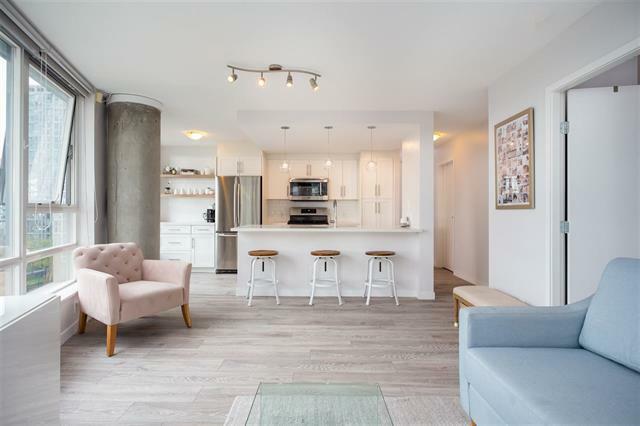 Beautifully renovated kitchen reno includes: enclosed Den extension into kitchen, extra wide fridge, brand new cabinets, backsplash tiles, marble countertops, new floors, new LED lights, faucets, and S/S appliances. Living room features new exterior roller blinds. Open floor plan gives you a perfect sleeping and living areas & extra flex space that can be converted into an office/additional closet. Built by Concord Pacific in a well maintained & problem-free building which features SPA LIKE amenities: 24 hr concierge, Club Max fitness gym, rooftop, decks, lap pool, sauna/steam room, movie room & much more. Move in ready. 1 Parking. OPEN Nov 3/4, 2-4PM.